Founded in 1893, Wheeler is the oldest continuously operating ministry of its kind in the state of Indiana. 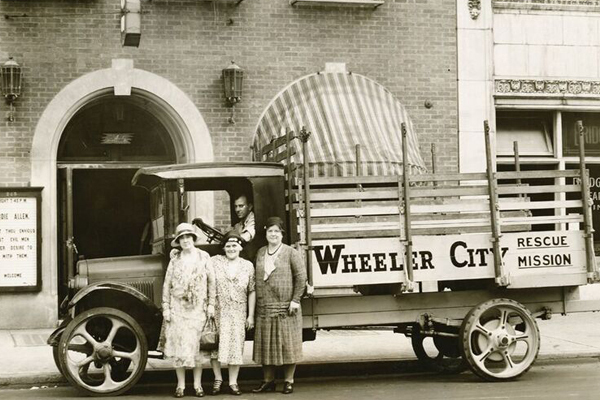 Click here for more Wheeler Mission history. 9 locations, dozens of ministries, a $11 million budget and 180+ employees. Wheeler is the largest and most diverse ministry of its kind in the state. YOUR MONTHLY GIFT TURNS VISION INTO REALITY! This statement of our faith below shall keep each of us grounded in Biblical truth so that we can lead others to a saving knowledge of the Lord Jesus Christ and correctly disciple them. We believe in the Scripture of the Old and New Testaments as verbally inspired by God, and inerrant in the original writings, and that they are of supreme and final authority in faith and life. We believe that man was created in the image of God; that he sinned, and thereby incurred, not only physical death, but also that spiritual death which is separation from God; and that all human beings are born with a sinful nature, and in the case of those who reach moral responsibility become sinners in thought, word and deed. We believe that the Lord Jesus died for our sins according to the Scriptures, as a representative and substitutionary sacrifice; and that all who believe in Him are justified on the grounds of His shed blood. We believe in the resurrection of the crucified body of our Lord, in His ascension into heaven, and in His present life there for us, as a High Priest and Advocate. We believe that Jesus Christ will personally and visibly return in glory to raise the dead and bring salvation and judgment to completion. God will fully manifest His kingdom when He establishes a new heaven and new earth, in which He will be glorified forever and exclude all evil, suffering and death. Please consider joining our efforts as we watch joy and hope renewed in the lives of those we serve as they discover God’s purposes for their lives. For 125 years, Wheeler Mission has been a pillar in the Indianapolis community, providing help, hope, and healing to people in desperate need. The Story of Wheeler Mission tells a remarkable testimony of God’s goodness, provision, and restoration. What began as a single ministry for women has exploded into a multi-faceted organization that serves thousands of men, women, and children every year. Readers will learn of the brave men and women who saw unmet needs in their communities–addiction, poverty, homelessness, isolation, and violence. They rallied together through Wheeler Mission to change the trajectory for their neighbors and their city. With the changing landscape of Indianapolis, Wheeler Mission has diligently responded to each evolving need. Through growth, setbacks, good times, and bad, Wheeler Mission has adapted its methods but never wavered from the Gospel foundation on which it was founded. 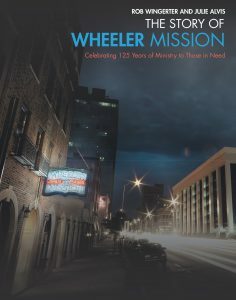 The Story of Wheeler Mission celebrates a rich 125-year legacy of faith, volunteerism, philanthropy, partnerships, and changed lives–and even more is yet to come! The Mission is founded under the name Door of Hope. It’s led by a hardware salesman, William V. Wheeler, who volunteers his time. William Wheeler dies, and organization is renamed in his honor. Present building built at 245 North Delaware Street. Wheeler’s own camp (later named Camp Hunt) opens. Wheeler begins to transform the Dearborn Hotel at 3208 East Michigan Street into a youth and family center, named the John D. Hughes Community Center, after its chief benefactor. Wheeler and The Care Center merge. Wheeler purchases the building adjacent to the men’s shelter at 205 East New York Street. Wheeler merges with Lighthouse Mission to enhance the programs offered to homeless men (later renamed Shelter for Men). The Care Center moves to the Community Center at 3208 East Michigan Street and is renamed to Center for Women & Children. New addition to Shelter for Men. Merged with Backstreet Missions in Bloomington, IN.